From sculptural knitting and painting to recording music with her husband and raising two daughters, Kelly Fleek's days are full of creativity. She characterizes her work as "the sum of a love affair with the commonality in the smallest and largest elements of life." Simply speaking she is a creative powerhouse. She utilizes her experiences as a woman and combines it with the natural rhythms of the world around her. 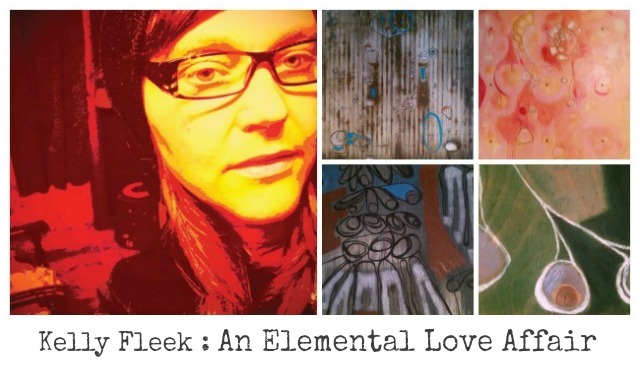 Fleek seems to view her art as a lifestyle, not just a form of expression. Living in Bow Washington, about 20 minutes south of Bellingham, Fleek shares a converted barn with her husband, two daughters, two dogs and the peaceful sounds of nature. However, this Saturday, June 8, from 6-9, as part of the Ballard ArtWalk, you can meet her here at Horseshoe Boutique, view her beautiful paintings and listen to an acoustic set of music performed by her band, The Spider Ferns. For more information about Kelly Fleek, visit kellyfleek.com.